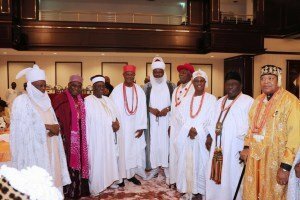 In the list of five richest kings in Africa published hours ago, the Olugbo of Ugbo Kingdom, HRM Frederick Obateru Akinruntan was named the richest monarch in Nigeria and the second richest in Africa. Moroccan Monarch, King Mohammed VI, is the richest in Africa with estimated net worth of $2 billion; second-placed Oba Akinruntan was rated to have an estimated net worth of $300 million, while the former Ooni of Ife, late Oba Sijuade is third with estimated net worth of $75 million. Oba Akinruntan who beat the likes of the Alaafin of Oyo, the Sultan of Sokoto, the Ooni of Ife and other to emerge the wealthiest monarch, is the Olugbo (traditional King) of Ugbo land, a small oil-rich community in Ondo state, in Nigeria’s southwestern region. Oba Akinrutan, who ascended the throne in 2009, is also the founder of Obat Oil, one of Nigeria’s largest privately-held oil trading companies. He founded the company in 1981 with a single gas station to meet the needs of his family and neighboring community. OBAT Oil now owns more than 50 gas stations across Nigeria as well as one of the largest tank farms in Africa- a modern storage facility that has the capacity to store 65 million liters of petroleum products. He also owns an extensive portfolio of prime commercial and residential real estate in London and Nigeria, including the landmark Febson Hotels and Mall in the Central Business District of Abuja. Oba Akinrutan entered the history books in 2012 when he became the first black person to buy the 2014 model of Bentley which was accustomed only for Queen Elizabeth of England.